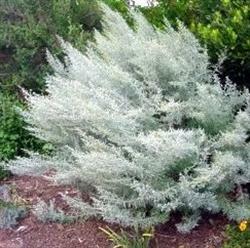 California sagebrush is an evergreen shrub with aromatic feathery foliage which is light green going to gray green asit matures. It is three to four foot high, and is native to much of central and southern California. It is a big part of the 'sage' in coastal sage scrub. Artemisia californica likes full sun near coast, west and even north slopes inland, requiring little or no water after established. Prune it back occasionally to prevent it becoming woody. Indigenous people made a tea that was used to reduce fevers.The smoke of the burning brush was used for removing skunk odor. Seeds germinate after wildfires, and burnt plants crown sprout after fires. This is a great wildlife plant, providing welcome cover for quail.A good plant for starting back a difficult south facing coastal sage scrub site. It is an important habitat plant for the endangered California Gnatcatcher.